Christmas time is here and that must mean we are now into the Formula 1 off-season. November ended with Lewis Hamilton winning the last race of the season in Abu Dhabi to further prove his dominance. After some improvement from Ferrari last year we still ended with the same result. 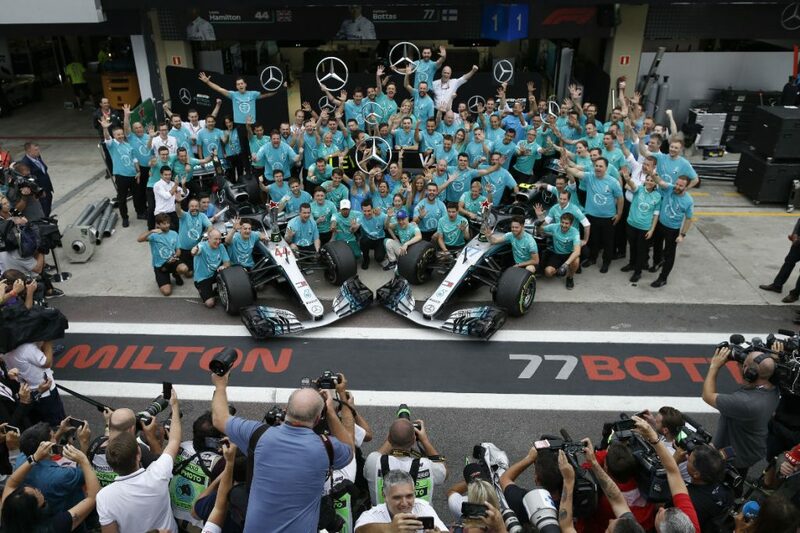 Hamilton and Mercedes picked up the majority of the wins and the British driver secured his fifth World Championship with a few races to spare. However there were many twists and turns with some truly excellent and thrilling races (oh how we missed those over the last decade or so) and for some time that inevitable ending was not a forgone conclusion. In fact, for quite some time, it looked like we were going to get a very different ending to last year. In 2017 Sebastian Vettel won five races, the last of which came after Hamilton had equalled his four championships. In 2018 Vettel had four wins after ten races, one more than his rival in the Mercedes. The fourth of those wins came at Silverstone after Hamilton had started on pole. This was it. This was the turning of the tide in F1 from silver to red. Fans of the sport could sense it as we watched a genuine title race, not just between two drivers of the same team, but competing teams. For all of us associated with Ferrari, we dared to dream that once again we would have a German saviour to bring us back to the promise land. Hope was back and this could be our year! To go from that high and optimism to how it finished seems somewhat unreal. The fall from those lofty heights were not only unexpected, but when it happened, it came down with an almighty thump. It leaves us with the question, what happened? It could be argued that the season turned back to a dominant one for Mercedes in one pivotal moment. Two weeks after his win at Silverstone, Vettel was back on home soil at Hockenheim. The German had not only grabbed pole, his title challenger had a car failure in qualifying and had to start the race in 14th. When the lights went out on Sunday Sebby had an eight point lead and was looking like he could extend that lead further with less than half of the season to go. The race itself was going fine for him. He was cruising. Unchallenged. It was meant to be a perfect weekend, ending in his first F1 victory in his native country. Further back Hamilton had valiantly fought his way back up to 4th. As it stood Vettel would have lead the championship by 21 points. Even if Lewis had finished 2nd, the lead would still have been 15 points. Instead, on a corner with no run off, a lapse of concentration from Vettel saw him go off the track and crash out of the race. It was one of the most bizarre retirements of the season. There was no pressure from any other drivers. 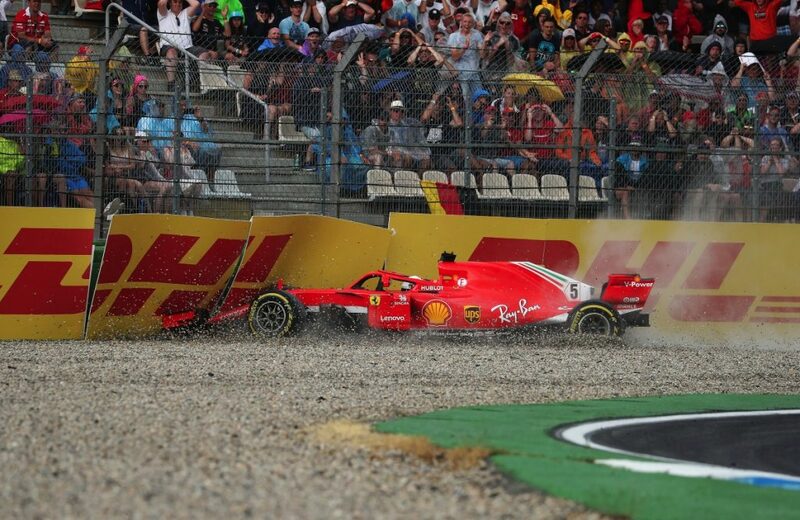 The conditions were not great, and would get worse, but it was nothing that would usually knock off Vettel in this position. In the chaos that followed, Seb was shown to hit his steering wheel in anger and frustration, followed by a radio message where you could hear the emotion come through as he realised the magnitude of what just happened. If that was not bad enough, Hamilton took advantage of the poor weather and made the miraculous comeback from 14th to win the race. From potentially being 21 points clear, Vettel was 17 points behind Hamilton in the space of less than an hour. 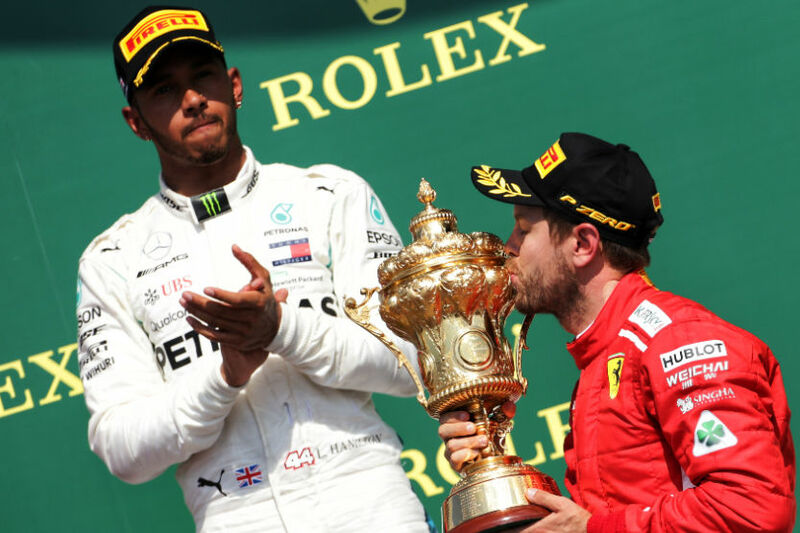 Lewis would win in Hungary before Vettel cut the lead back down to 17 with a win in Belgium. But that would be the last win for Vettel in 2018. For at least this reporter, that was the moment things started to go south for Ferrari, and the dream began to fade. Hamilton went on to win six of the remaining eight races, solidifying his position as one of the best drivers in F1 history. Despite the early challenges from Ferrari, it could be argued that this was his most dominant season. When he wasn’t on the top step he was consistently on the podium when the checkered flag come down. Only once did have to retire his car and all of his finished were in the top five. That level of consistency kept the Brit in the title race whilst Vettel was winning early on. 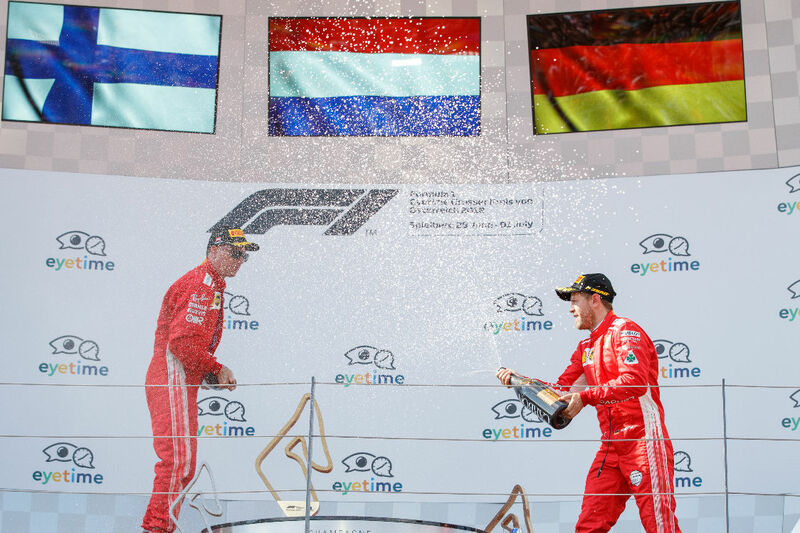 Vettel on the other hand finished on the podium without a win six times with two of those coming after Hamilton had secured the championship. Too many times Ferrari found themselves off the podium. It is a level of consistency they will need to improve in 2019 to have a real shot of challenging Mercedes. It was not all bad though. When the season was pretty much over the Tifosi were given a parting gift from one of their favourites. Amongst the major reshuffle with drivers for next season it was announced that Kimi Raikkonen would be moving on. The Finn had not won a race since returning to Maranello in 2014. How glad we were, Ferrari and F1 fans, to see him get back on to that top step with his 21st race win in Austin, Texas. It was a fitting farewell to one of the great characters in modern Formula 1, proved in his radio message after the race when he simply said “f***ing finally”. Kimi, never change. He isn’t riding off in to the sunset just yet though. Kimi moves back to the team where it all started, Sauber, for 2019. In his place steps in a driver Sauber had on loan from Ferrari, Charles Leclerc. In is not like Ferrari to promote from within, despite their successful young driver programme. It is also unusual to hire someone so young, aged just 21. But the Monaco native quite simply forced the decision to be made by Ferrari. He blew away the competition on his way to an F2 championship following that up with a fine rookie year in F1. In what was a car that most people thought would not do that well, he secured a points finish ten times, finishing 7th (a best of the rest position behind the three big teams) in the last three races. He was also good in qualifying, dragging his car in to the top ten where others like Fernando Alonso and teams like Renault and Force India were struggling to find that level of consistency. 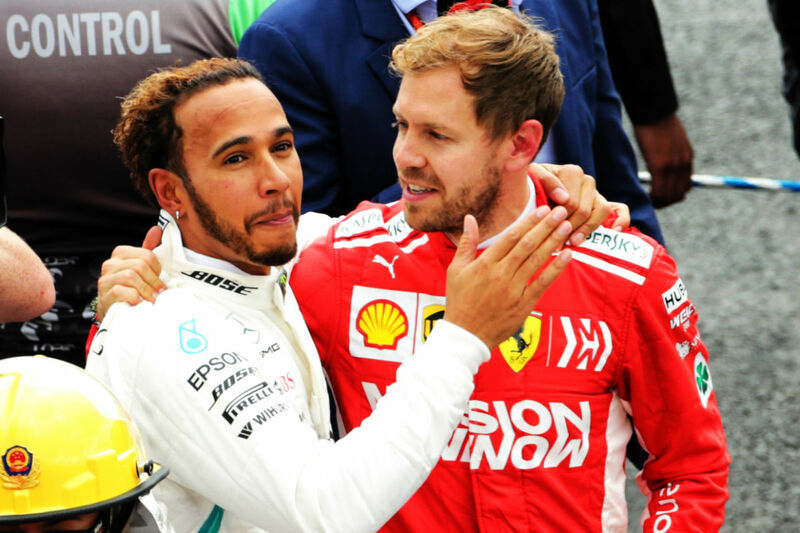 It is a bold move from Ferrari but the time is right to bring in a new impetus, not only to push Ferrari closer to the top, but also his new teammate as he hopes, like most of us here, a championship will be heading back to Maranello come this time next year.